See other skies around the world today. I like the way the sun seems to be coming forward, round the tree. Windy day, by the look of the wavelets. My Sky Watch Post, have a nice weekend! You certainly 'captured' the sun in that corner. Amazing....in that you have no people in that picture! Usually that is not possible there. Great stuff! Such a serene and lovely shot! 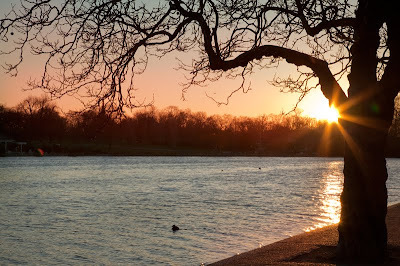 Down by Hyde Park and Kensington Gardens they sure are a great place to watch a London sunset. This is such a gorgeous photo! Somehow unmistakeably English!